Imagine Desperate Housewives being written into a book – just a little funnier, sarcastic, edgy perhaps and with a dash of American angst, loneliness and the no-good housewife, trying to make something of herself. But the stories in Helen Ellis’s book “American Housewife” is not just about the average housewife, so don’t be fooled by the title. The book is about dreams gone wrong, frustrations dying to get a way out, of thwarted hopes and a lot of pointed commentaries on womanhood and the world around them today. The stories range from the unique initiation ritual of a book club (the twist is there throughout the story and you can sense it) to the set of a rigged television show to the getaway car of a pageant princess – they are all unique and full of wit and tragedy. I think for me reading this book felt like I could connect on so many levels – well not of being stuck in a marriage or being betrayed in a relationship, but just that I could relate to the women and the layers of intensity of emotions of every kind that Ellis draws up for this through the dozen stories. What struck me the most while reading these stories was the tone and pace of each story and how each is different from the other, when it comes to those two parameters. Some stories are definitely sharper than the others, and some just jolt you off your daily existence to make you see how bizarre life can really be. “American Housewife” is a brilliant, raw and real collection of stories that tells you a lot about women in general, only if you care to listen or in this case read. I would most certainly recommend it to every one out there. Waiting for her next! This entry was posted in 2016, April 2016 Reads, Doubleday, Helen Ellis, Literary Fiction, short stories and tagged American Housewife, contemporary fiction, doubleday, Helen Ellis, penguin random house, short stories, Suburban Housewife, Women on April 26, 2016 by thehungryreader. I had never read anything by Kate Atkinson before this one. I had heard a lot about her, but of course and was quite intrigued by the titles of her earlier books. At the same time, every time I would try reading an excerpt from any of her books online, I could not connect with them. I guess maybe the timing wasn’t right. Maybe there are times when some books will call out to you and some will not, no matter how ready you think you are to read them. Books have a mind of their own I guess. It was time for me to read an Atkinson novel and I did. “Life after Life” just as the title suggests, is nothing but that – life recurring after life and life. Confused? I guess I was a little as well when I started the book, but not when I was half-way into it, and definitely not when I was a quarter into it as well. It is a big book at five hundred and twenty odd pages, however it doesn’t feel like that (most good books don’t make you feel tedious about their length or size). The book’s premise to me is from Plato’s famous philosophical ground: “Everything changes and nothing remains still”. This gets weaved in with the story of our protagonist’s life – Ursula Todd. Ursula Todd is born to Hugh and Sylvie Todd at their home in England on a winter night in February 1910. She dies the very same night. But this is not where her story ends. This is where it begins. She gets another chance at life and keeps getting them – again and again, a recurrence of sorts. This is not a fantasy story, just to clarify it right at the outset. The multiple lives and deaths of the character are beautifully told by Kate Atkinson and the déjà vu atmosphere of the book is not lost. The idea of karma and deep-rooted philosophy shines with clarity at almost every single page and I for one could not help but turn the pages again and again. The character is but obviously remarkable and has many layers to her. Ursula’s life even though quite remote from ours can be connected with instantly. The writing is poetic and does not get mundane at any point of time (though there was a danger of it getting that way at some point in the book). The language is rich in metaphors and scenery. More so for me, what worked was the linear plot of the book and yet Atkinson could tell so much in it. I am not giving away too much of the plot only so you can experience the reading for yourself and make your decisions on how you feel at the end of it and midway through the book. The existence of a person and also again and again says so much about the philosophical layers about the book. The entire premise of the book to stand on one idea and that too so uniquely put is quite a task successfully achieved by Ms. Atkinson. The idea that life can be got right, living life after life is reflective and yet monotonous to me. Having said that, the book is a wondrous idea and story of endless lives (in the sense) and what we go through living them. A read that you must gift yourself this year. 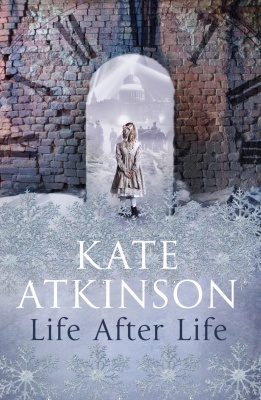 This entry was posted in Books, Doubleday, Literary Fiction, random house, Random House UK, Review and tagged Doubleday books, Kate Atkinson, Life After Life, lives, Random House UK, Reincarnation on March 24, 2013 by thehungryreader.